TODAY’S GUEST ARTIST IS SPONSORED BY THE A. STUART FENDLER FAMILY TRUST. Vadim Gluzman’s extraordinary artistry brings back to life the glorious violinistic tradition of the 19th and 20th centuries. His wide repertoire embraces contemporary music and his performances are heard around the world through live broadcasts and a striking catalogue of award-winning recordings exclusively for the BIS label. The Israeli violinist appears regularly with major orchestras such as the Chicago Symphony, London Philharmonic, Israel Philharmonic, London Symphony, Leipzig Gewandhaus, Munich Philharmonic, San Francisco Symphony, Minnesota Orchestra and NHK Symphony; and with leading conductors including Neeme Järvi, Michael Tilson Thomas, Andrew Litton, Marek Janowski, Itzhak Perlman, Tugan Sokhiev, Paavo Järvi, Rafael Frühbeck de Burgos, Hannu Lintu and Peter Oundjian. His festival appearances include Verbier, Ravinia, Lockenhaus, Pablo Casals, Colmar, Jerusalem, and the North Shore Chamber Music Festival in Northbrook, Illinois, which was founded by Gluzman and pianist Angela Yoffe, his wife and long-standing recital partner. In this 2013-14 season, Mr. Gluzman begins a new collaboration as Creative Partner andPrincipal Guest Artist of the ProMusica Chamber Orchestra in Columbus, Ohio. As Artist of the Year with the Bergen Philharmonic Orchestra, he performs a series of three concerts with conductor Andrew Litton, which will result in a new album of concertos by Shostakovich and Gubaidulina. In the United States Vadim is making his début with the Philadelphia Orchestra under Tugan Sokhiev, and in the United Kingdom, Gluzman’s highly anticipated Wigmore Hall recital follows last year’s acclaimed Proms début. Vadim Gluzman has given live and recorded premieres of works by composers such as Giya Kancheli, Peteris Vasks, Lera Auerbach and Sofia Gubaidulina. In recent seasons, he has given the UK premieres of Michael Daugherty’s Fire and Blood concerto with the London Symphony Orchestra under Kristjan Järvi; and of Balys Dvarionas’s Violin Concerto with the BBC Symphony Orchestra conducted by Thomas Søndergard. Mr. Gluzman’s latest CD features Sergey Prokofiev’s Sonatas No. 1 and 2 as well as three transcriptions from Romeo and Juliet. Accolades for his extensive discography under the exclusive contract with BIS Records include the Diapason d’Or of the Year, Gramophone’s Editor’s Choice, Classica Magazine’s esteemed Choc de Classica award, and Disc of the Month by The Strad, BBC Music Magazine, ClassicFM, and others. 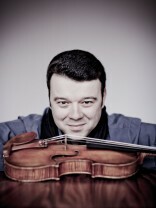 Born in the former Soviet Union in 1973, Vadim Gluzman began violin studies at age 7. Before moving to Israel in 1990, where he was a student of Yair Kless, he studied with Roman Sne in Latvia and Zakhar Bron in Russia. In the US his teachers were Arkady Fomin and, at the Juilliard School, the late Dorothy DeLay and Masao Kawasaki. Early in his career, Mr. Gluzman enjoyed the encouragement and support of Isaac Stern, and in 1994 he received the prestigious Henryk Szeryng Foundation Career Award. Vadim Gluzman plays the extraordinary 1690 ‘ex-Leopold Auer’ Stradivari, on extended loan to him through the generosity of the Stradivari Society of Chicago.